The ileo-caecal appendix is part of the digestive system. The ileo-caecal appendix is a small outgrowth of the caecum, usually located on the right-hand side close to the pelvic region. 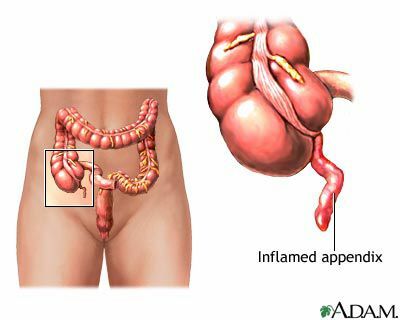 It is well known as the organ responsible for appendicitis (inflammation of the appendix). The appendix, however, does not have a clearly established function. Patients do not have any particular problem if it is removed. However, it may act as a secure reservoir for intestinal bacteria. The appendix is a hollow compartment, beneath the opening of the ileum and is like a form of extension of the caecum It varies in size from 6 to 12 centimetres long and 4 to 8 millimetres in diameter. It is supplied by the appendicular artery.